This week we will be rolling out a rather substantial set of updates for Version 2. 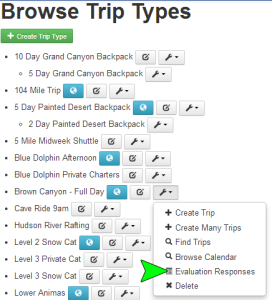 The updates include things like the ability to have multiple guest-facing sites, better guide scheduling tools including a combined view for scheduling all upcoming trips, the ability to create evaluations for rental items, the ability to browse evaluation responses per trip type, trip, guide or rental and the ability to create sets of rental items. There are also a lot of other little updates and fixes that will be rolled out as well but these are some of the more substantial features being added during this update. The ability to have multiple guest-facing sites will allow you to maintain two different guest facing sites that will be governed by the business groups the sites are associated with. Each site will only have access to the trips and rental items contained in the business groups the sites are assigned to. This feature will be especially handy if you have different sites that control or sell different aspects of your business. For example, if you have summer and winter businesses that are run as two separate divisions of your company and have completely different guest facing sites, you will be able to assign those sites to the appropriate business groups making sure the summer site only lists the summer trips and rental items while your winter site only contains the trips and rental items you offer during the winter. Or if you offer horse back riding on one site and multi-day hiking trips on another then you can create guest facing sites for each of these different web sites. The guide scheduling tools are getting quite a few new useful tools. These tools include the ability to enter “Start Dates” and “End Dates” as well as the ability to enter vacation dates for your guides. These dates will let Arctic know when your guides are available to work and when they are not. If a guide is not available, they will not appear in the list of guides when you are scheduling trips. Also there is a new “Guide” page found under the “Trips” menu that will allow you to schedule your guides on all of your upcoming trips from one page. You will no longer have to go to each and every trip and click the “Schedule Guides” button to schedule your guides. You can use the “Guide” page and schedule your guides for multiple trips all in one place. Both of these features will make managing your guides in Arctic much simpler and easier. In this update, you will also now be able to create evaluations for rentals. This is particularly useful for lodging rentals. To create a rental evaluation you follow the same steps for creating a trip evaluation. Once the form is completed you will assign it to your rental business groups by going to the “Settings” page and choosing the appropriate business group from the blue “Business Group” drop down menu at the top of the page. If you have only one business group or plan to use the same evaluation for all of your rentals you will leave it on the “System – Wide Settings” business group. Once the appropriate business group has been selected go to the “Rentals” section of the “Settings” page and click the “Pencil” icon next to “Evaluation”. This will open the “Configure Evaluation” page where you will select the evaluation form you created to use for this rental business group and then click “Save Setting” to save your changes. Note, you will only see the “Evaluation Responses” option in the “Wrench” menu, if the trip type has an evaluation form assigned to it. As you can see there are also other handy tools in the new “Wrench” menu, such as the ability to create trips, find trips, browse the calendar or the ability to delete an existing trip type. As with the “Evaluation Responses” button when you select the “Evaluation Responses” from the “Wrench” menu the evaluation responses will automatically be filtered for that specific trip type. This is also true of the “Find Trips” and the “Browse Calendar” options also found in the “Wrench” menu. Finally, the last big new feature being added in this update is the sets of rental items feature. 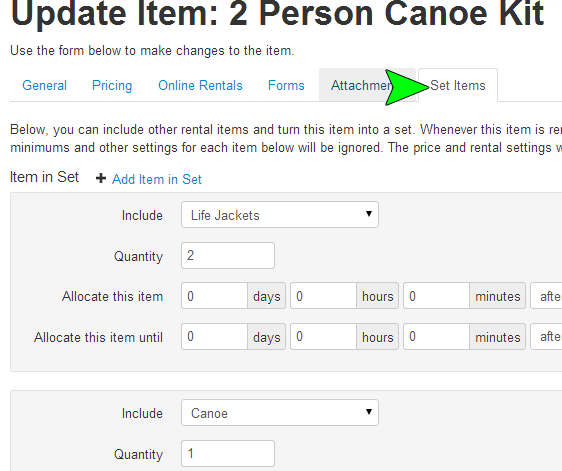 This new feature will allow you to create sets of rental gear that can be rented all together as one item. Arctic will track the inventory associated with each item included in the set to be sure you do not over extend your inventory. This works particularly well for things like camping gear packages that included a backpack, tent, sleeping bag and camp mat. With the rental item sets you will be able to make a single item called “Camping Gear” that will include all of the individual rental items and Arctic will allocate the appropriate number of each item in the set each time someone rents “Camping Gear”. If you would like to use this feature, you must turn it on by going to the “Settings” page under “Rentals” and clicking the “Pencil” icon next to “Enable Rental Item Sets”. Once the feature is turned on you will see a new tab on your “Create/Edit Rental Item” pages that will be called “Set Items”. 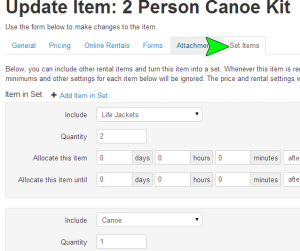 This is where you will add the rental items that should be included in the Rental Item Set. We will be adding support documentation for all of these features in the coming days but if you have any questions or encounter any issues using the new features, please feel free to contact technical support. You can email us at support@arcticreservations.com or call (601) ARCTIC 9 (that’s 601-272-8429). Ok, so many of you have had this come up at least once. You have an international customer who tries to either book or pay their invoice online and their cards are declined. This may have even happened when you tried to process the transaction through the back end making life really frustrating for you and your international guests, especially when you can’t figure out why and you are 90% positive you have been told that Arctic is internationally friendly, capable of handling international phone numbers and addresses. So you start thinking you were bamboozled and Arctic isn’t internationally friendly. It’s an Isolationist who only likes US citizens and is screwing up your business with your international guests. All of which is accompanied by a choice selection of expletives, weeping, wailing and gnashing of teeth. Can I get an amen? Well, I am here to set the record straight. Arctic is not the evil villain of this story. Your payment gateway is the one who is thwarting your international transactions. Arctic is, in fact, capable of accepting international addresses and phone numbers. Arctic provides the gateway with all of the information needed to verify the card. The problem, when processing international payments, is that your gateway fraud protection settings are most likely set to reject transactions where the address and zip code cannot be verified. If all of the information was entered correctly, there is still another issue at play and that is certain international countries or regions don’t allow or support address verification. Germany and Australia tend to be common culprits. Most gateways can work with some international countries or regions without an issue, but there is just nothing to do for the countries that, either for legal reasons (consumer protection) or technological reasons (different credit card infrastructure), cannot validate addresses. So, when you have address verification as a requirement for your fraud protection settings on your gateway, the unverifiable addresses will be declined every time.